You can skip this section if you are using a lab computer with Python already installed. Otherwise, download Python 3 from the Python web site. The install process is entirely straightforward, just work your way through the steps. 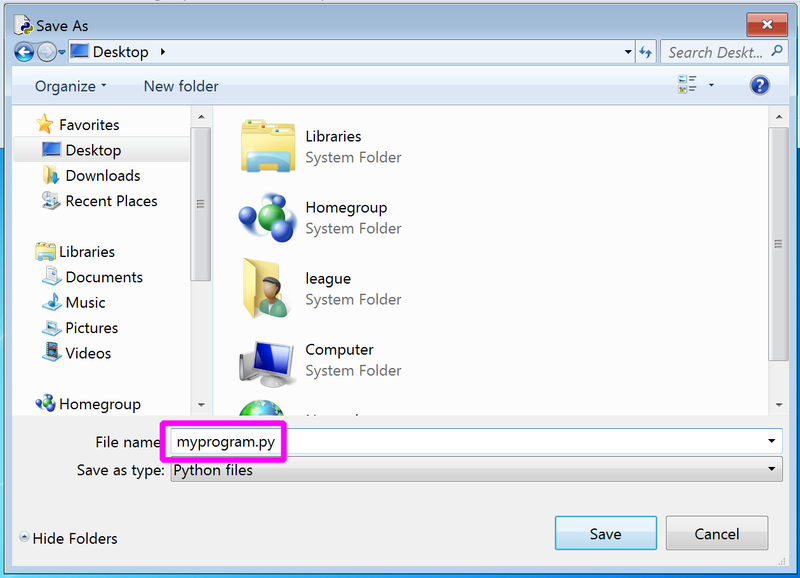 From the Windows Start menu, select All Programs » Python 3.x » IDLE. There will be a similarly named program in Applications » Python 3.x on the Mac. A window called the “Python Shell” will appear. It displays a prompt like >>>. This is the window in which you will interact with your program. You need a second window, in which you will type and save the content of your program. Select File » New File from the menu. While in the new window, select File » Save and give it a filename that ends with .py (this will enable syntax coloring). 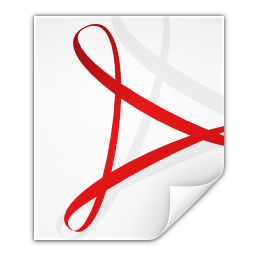 You can also choose the folder to save it in, such as your Documents or Desktop folder. Type your code into the .py file, and save it with File » Save, or Ctrl-S or ⌘-S.
Use Run » Run Module (F5) to run it, and interact with the program in the Shell window. The double quotes indicate a string of characters (text). That portion is output exactly as written. Any portion not in quotes is interpreted by Python. Thus the difference between printing 3+4 (which produces 7) and printing "3+4". Dismiss that message, and you see it also highlights a portion of your program in red. Often the red part is just after the source of the actual error. In this case, we omitted the comma between the two different things in the print statement on that line. The actual error is the last line. This one is called a NameError. But the Traceback section can help you too, by telling you which line number to examine (in this case, line 4). Variable names are case-sensitive, so x and X are both valid, but they are not the same variable. 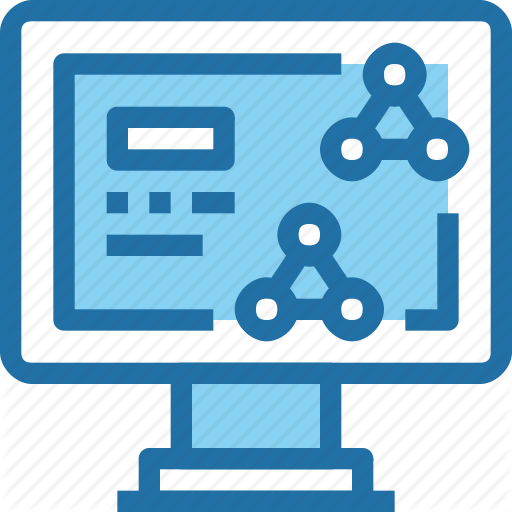 Below is a program that uses variables to perform a computation. Python (and most languages) distinguish between numbers that are integers (whole numbers), and numbers that can contain decimal points. The latter are called floating-point numbers. When you divide two integers, Python 3 automatically converts them to floating-point – not every language does this. If you want integer division, use a double-slash (//) as the divide operator. It can even be used to disable a line of code without deleting it from your program… then it’s easy to put back if you need to. This is called “commenting out” code. Running the program looks like the following. The parts the user types are indicated by «angle quotes». You are 31 years old. The last example in that block is <=, pronounced “less than or equal.” There is also >= for “greater than or equal.” You cannot have a space between the two operators: < = will be a syntax error. This statement above does not ask whether my_quiz_score is equal to the value 38. Instead, it sets the value of that variable to 38, and whatever value it had previously is lost. That last example determines whether the value of my_quiz_score is within a certain range: from zero to forty, inclusive. Now that we’ve seen Boolean expressions, we’re ready to explore conditional statements. They have a keyword if (must be lower case), and then the Boolean expression, followed by a colon (:) – it’s a very common mistake to forget the colon! Congratulations, that's a good score. Thanks for taking the course. When you run it, try entering different values at the prompt in the shell window, and observe the results. You can see that the indentation increases each time an if is embedded within the else of another if. 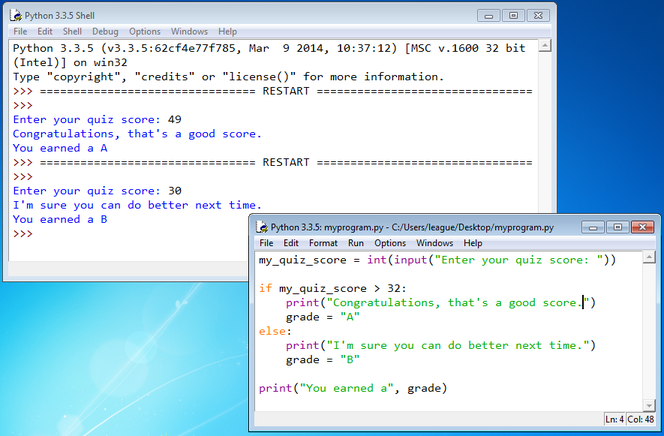 Try tracing this code with my_quiz_score set to different values, to see what ends up being stored in grade. You may even want to revise the previous program using this technique, so it can output more than just A or B. This program does the same thing as the previous one, but it’s a little cleaner and shorter. It will ask for three scores, but then drop the lowest one before computing the average of the other two. Once you have saved your .py file, it may not work just to double-click your file again to reopen it. That will run the program in a console window, which is especially awkward because it might not pause to show the output before the window disappears. 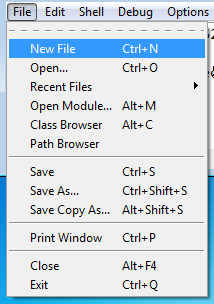 Instead, you can right-click in the .py file and select “Edit with IDLE” (if on Windows). Or simply open IDLE first and then use the File » Open menu and navigate to the .py file from there. This prints a bunch of powers of two using a for loop. This is a variation of the previous, where we find the first power of two that is larger than ten million.